Being able to see the big picture of your sales process is vital if you are to successfully prioritise where to invest effort, anticipate issues and apply repeatable tools and techniques to accelerate winning orders. This Business Accelerator – Sales Diagnostic Tool allows a root cause analysis of key issues to solve and barriers to remove in order to accelerate that order! 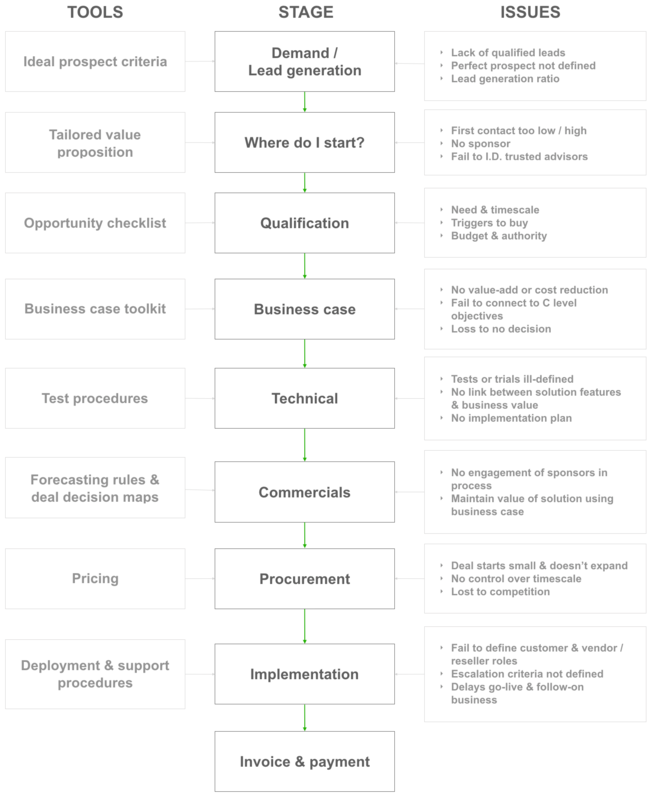 Enterprise technology sales are often a long complex process. The customer’s buying cycle needs to be kept aligned and inter-locked with your sales steps and there are many internal and external dependencies with lots of people involved. With so many moving parts the detail in any one – whilst being essential for analysis – can also obscure the overall status of a sale. It is essential, therefore, to have a one-page snapshot to both establish where you and your team are in the sale – and what issues need solving to move ahead to the next step. Starting from demand / lead generation, there needs to be a correct and precise definition of an ideal prospective customer – an obvious requirement but one which many companies fail to provide to their sales teams. Without this “perfect prospect” persona, marketing and sales lead generation will be inefficient and time will be lost giving your competition an ideal opportunity to get ahead. Mapping the potential contact points in the customer’s organisation is also essential: Where to start selling to the customer? Which department, job role and message to deliver? Is the sales opportunity qualified? Spending valuable selling time on prospects that do not have need, money or authority is a waste of time and resource. Even worse is the lost opportunity of not getting in front of prospects that are qualified. Building a solid actionable customer business case resulting in either bottom line savings, top line growth or achieving a C-level strategic objective is a key step in the sale. The customer’s own data must be the foundation of the business case and not generalised figures taken from “the market” or some other distant source. Technical considerations need tightly managing and completing to ensure approvals from both strategic and operational IT stakeholders. Commercial and procurement steps will only be successful if the prior stages have been completed correctly and have the support of the main customer contact that is sponsoring the sale at an executive level. Finally, implementation of the solution needs to be controlled to ensure that not only the vendor but also the customer delivers the agreed resources required and if a 3rd party reseller or integrator is involved they also meet their commitments. Of course, a sales process is nothing without the calibre of people to execute it which is why we have developed our success accelerator programme which helps get newly hired team members effective, efficient and contributing to revenues in as quick a time as possible.